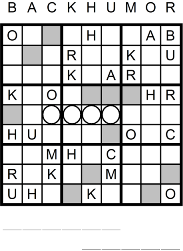 A couple of people have asked me to post a sample Whodoku puzzle. Well, I finally got around to it. Check it out at www.whodoku.com, where you'll find the full puzzle plus instructions. For more information on Whodoku, see my earlier post. To buy Whodoku on Amazon, click here. How long has this been for sale? Amazon shows it with 3 used copies already. @mt si: It's been about a month. All the copies for sale on Amazon are new. Who would buy a used puzzle book anyway? I can just see the ad: "Used puzzle book -- good condition, lightly solved." Even the sellers that are charging less than the list price of $5.95 will make a profit when their S&H charges are factored in. Very nice. Does your bank of letters always spell something Englishy (like "BACKHUMOR" in this example)? Seems like that would come in very handy as I'm scanning a column, a row, or a 3x3 square for what's missing. @sblom: Yes, the letters always spell out something "Englishy." Sometimes, it's a nine-letter word, like SHORTCAKE or NIGHTMARE, and sometimes it's a phrase, like BUNKO LIAR, SOLAR WIND, MAP VENDOR, or OVAL TIRES. Of course, some like BACK HUMOR don't make a lot of sense, but you're right on the reason. At first, I didn't think this was necessary, but my editor, Peter Gordon at Sterling Press, convinced me otherwise. This book is great, I bought it on Sunday and have been trying not to do too many puzzles in one day. Sometimes the clues are easy to figure out, there aren't many people known by one name for example and this has helped on a couple of the harder puzzles. Sometimes I haven't heard of the people so I look them up and add to my store of useless trivial knowledge, so that's a plus too. The "Englishy" words are also great, it makes it easier to remember the letters as apposed to a string of random letters. Great Book, I loved it.